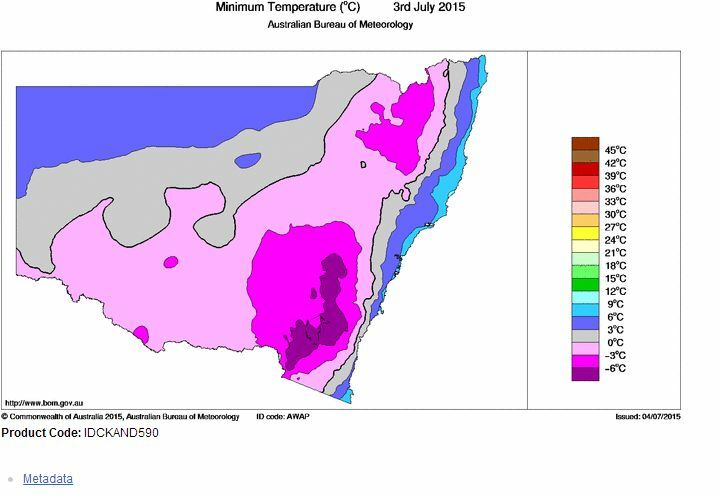 Winter for 2015 has been colder than that observed in recent years and some significant cold weather including snow fall has been documented over a wide area. 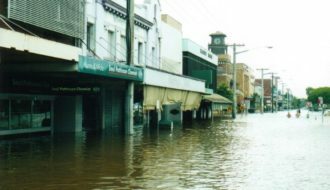 1 - Staying three nights at Albury to wait out the cold front, experience the rain band, the passage of clearing showers and cold maximum daytime temperatures. 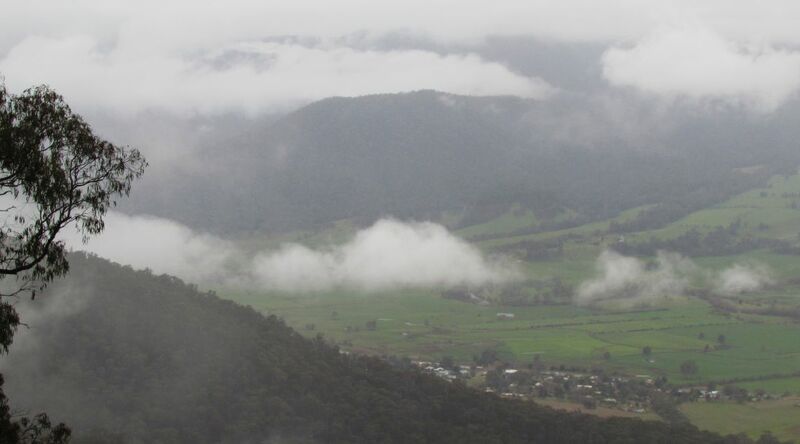 2 - Staying two nights at Corryong to experience fog conditions then the snow fields on the western flanks of the Snowy Mountains. 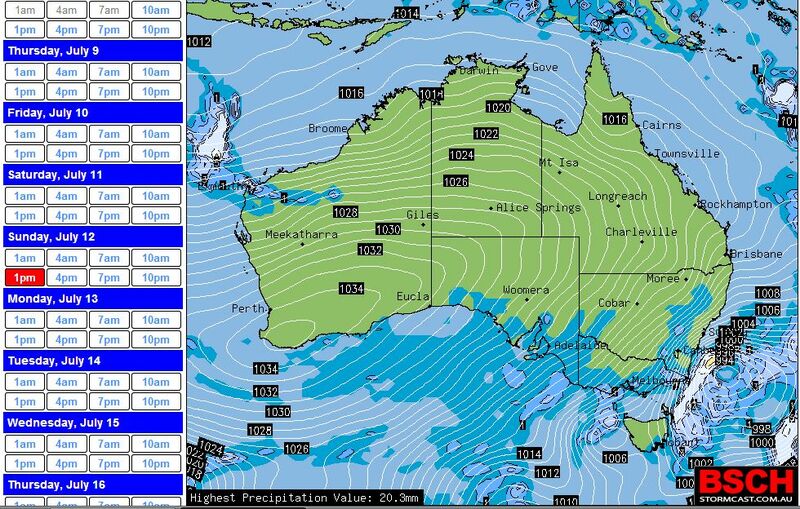 An entire cycle from a high pressure cell to a new high pressure cell occurred during the 5 day period. The area has experienced a cold winter with occasional snow falls down to quite low levels. 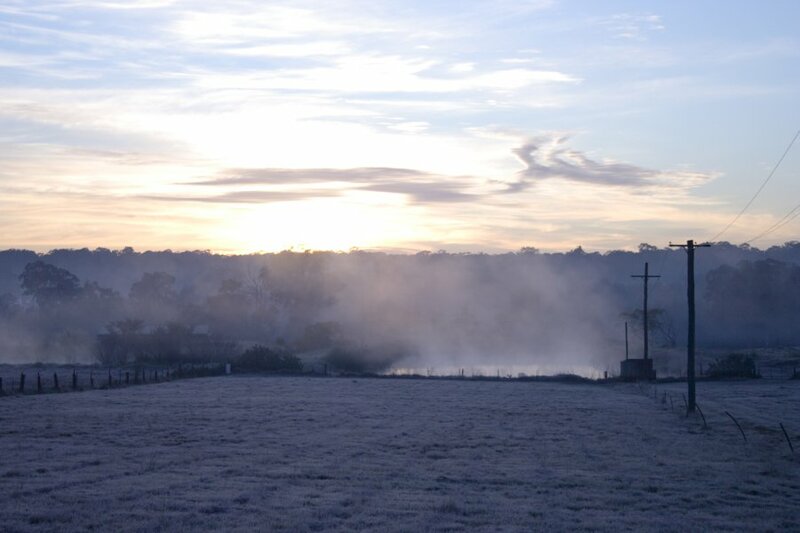 Morning frost has been common and there have been numerous days where maximum temperatures have failed to reach 10C. 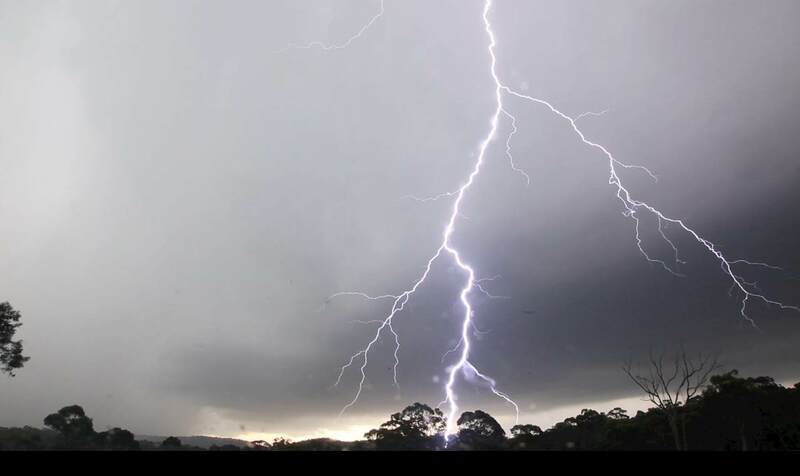 On Wednesday 12 August, the cold front approached from the west that brought a rain band. However rainfall was not heavy as evident of 5.4 mm in the rain gauge at Albury Airport. However it was the maximum daytime temperatures that were noteworthy which continued the cold winter weather. Heavy cloud, mainly nimbostratus variety ensured that the maximum temperature did not exceed 9C in low lying areas. Snow was forecast down to approximately 1,000 metres and I attempted a snow chase, first at Stanley where Mt Stanley rises 1,067 metres in elevation but I could not reach above approximately 800 metres due to very bad roads. I turned and left to go to Tawonga Gap (895 metres). 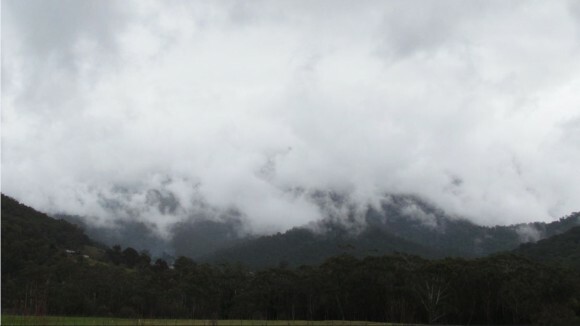 I drove past Mt Buffalo (Image 1) which was shrouded in nimbostratus cloud and rain with snow falling across the top. After I reached Tawonga Gap at 895 metres, I proceeded along a track (walking) which took me higher to between 1,000 and 1,050 metres but could go no higher. I did not encounter snow but instead encountered bone chilling cold wet conditions. The temperature could have been as low as 3C given the elevation difference and temperature difference that was occurring between valleys and higher areas. I could not reach the snowline but I noticed that the rain was very cold. 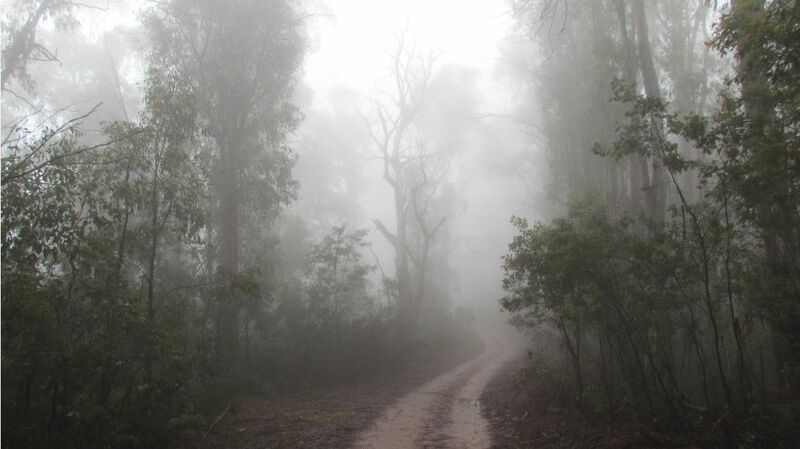 I found myself walking in a cold fog (Actually the lower ramparts of nimbo stratus cloud). Images 2 and 3 shows the conditions that I encountered in my attempt to walk up to the snowline. If the path had gone higher, I would most likely have reached the lower snowline. 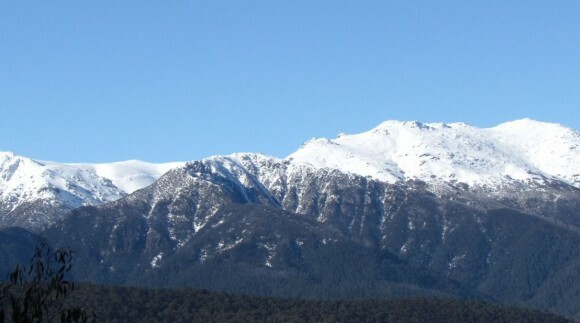 At the time, an emergency on nearby Mt Bogong was being played where a skier had become injured during a snow trek but a snow storm was hampering efforts to effect a rescue. Low cloud grounded the helicopters. On Thursday 13 August in the wake of the cold front, passing showers and a cold south west wind certainly made for a winters day. 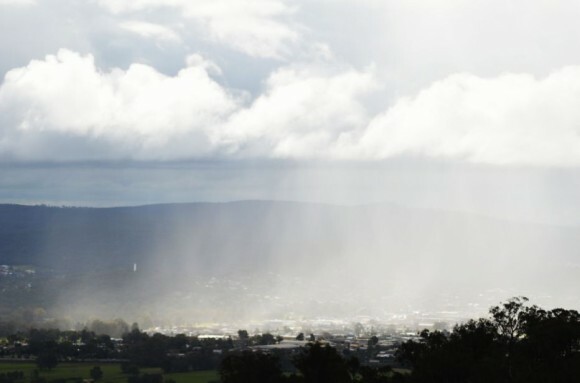 I set myself up on the summit of Huon Hill overlooking Albury Wodonga and watched passing showers make their way across the region (Image 4). Maximum temperatures struggled to reach 12C although a biting wind chill made that feel much colder. 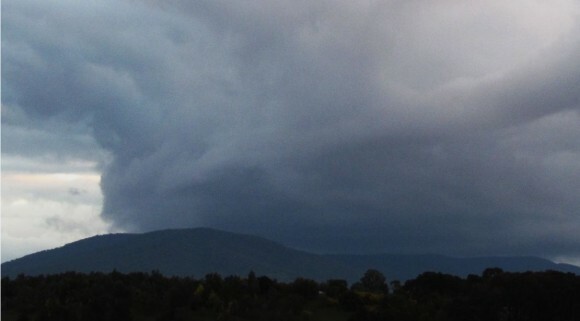 At sundown, I watched dense cloud build over Mt Baranduda to create a stormy outlook although it was just a shower building in cold air (Image 5). 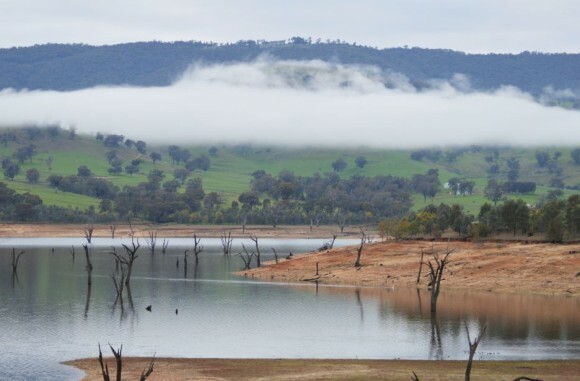 On Friday 14 August, I drove to Corryong in the Upper Murray Valley along Route 542. Under cloudy skies, I noted much fog and fog stratus forming against the backdrop of the hillsides creating a classic cold winter backdrop. This lasted all day due to persistent alto stratus and stratus cloud cover. Image 6 shows the type of conditions experienced. On Saturday 15 August, with the break up of the cloud cover under a new high pressure cell, I was fortunate enough to encounter the west side of the Snowy Mountains not often seen in winter (Image 7). Taken from Scammells Spur lookout on the Alpine Road between Khancoban and Tom Groggin Station, this is the incredible scene that greeted me. It was only the middle of July 2015, that concerns were being raised for a bad snow season. Numerous cold fronts providing snow has provided a spectacular scene. Deep snow now cover the Snowy Mountains following the change in weather fortunes. The official snow cover depth at Spencers Creek according to Snowy Hydro stands at 131.5 cm taken 12 August. I drove to Dead Horse Gap where I finished my winter scene project whilst enjoying the snow cover. 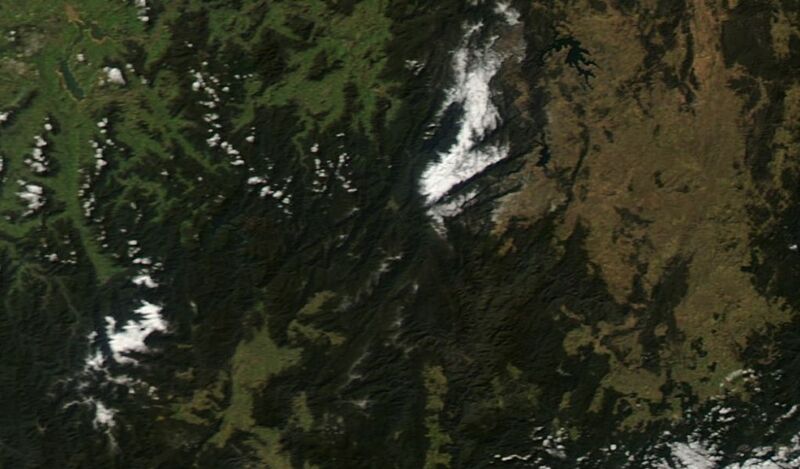 Interestingly, I could see no snow at the Thredbo township below me. After 2 hours, I drove back along the Alpine Way back to Scammells Spur lookout just as thick cloud began to obscure Mt Kosciusko and the Main Range ahead of the next cold front. This completed the winter experience and one entire cycle through a cold front to a new high pressure cell. I returned back to Sydney during Sunday 16 August 2015. Although not incredibly cold, I was outside quick smart attempting some photographs. Taking photographs of frost is not always easy to expose and portray.